In a few minutes, the Digital Workspace Showcase keynote will take place. This keynote will show the future of end-user computing. I will be updating this blog as they make announcements and perform demonstrations. 4:32 PM – Room is pretty full. Looks like we are running a few minutes behind while everyone takes their seats. 4:34 PM – The keynote is starting with a video about EUC issues. Some laughter in the crowd. 4:35 PM – Shankar Iyer and Noah Wasmer take the stage. They’re talking about the history of EUC at VMware. Noah is talking about the business transformation that VMware EUC can provide to a variety of use cases. 4:38 PM – Companies with engaged workforce’s earn 147% more per share than their non-engaged competitors. 4:39 PM – Horizon cloud services are available over 25 regions between AWS, Azure, and IBM Softlayer. Workspace ONE is processing over 450 BILLION events per month. 4:41 PM – CIOs are saying that they can’t recruit talent unless they upgrade their end-user computing infrastructure. There are three core ideas to bring an intelligence-driven digital workspace to life. These three pillars are built on a foundation of intelligence and automation. 4:45 PM – Shankar announces the first Employees-First Award to highlight a customer that brings digital transformation to their employees. Adobe Systems wins the award. The first announcement is Dell “Ready to Work” Solutions. Brett Hansen, VP at Dell, joins Shawn on stage. The first point that they are discussing is the ability to manage Dell hardware with Workspace ONE. Dell is providing factory integration of Workspace ONE so users can receive a laptop directly from Dell, already integrated with Workspace ONE, so they can boot it and have their applications provisioned as if they were a mobile device. Large applications are preloaded in the factory. This sounds like the existing Dell factory process with Workspace ONE preinstalled and registered. In order to prevent untrusted applications from being run on the machine, Workspace ONE will integrate with Device Guard to prevent untrusted applications from running. Trusted applications can be downloaded and run through the Workspace ONE portal. 4:57 PM – Announcing Windows 10 Industry Baselines. These are prepopulated templates with policies configured to meet various industry baselines. Baselines can be updated and modified by administrators. This solution provides 100% GPO coverage and 100% modern policy management coverage. Device Update Readiness is an automation capability that will let IT fully automate the process of application compatibility testing. Workspace ONE Intelligence will detect applications that are blocking the deployment of the latest version of Windows and allow IT to automatically send alerts to the developers. CVE Vulnerability Remediation is a Workspace ONE Intelligence service. It pulls in a CVE database into intelligence and provide information about the vulnerability and provides the ability to automate the approval of a patch, deployment of the patch, and alerting the security team that it was being proactively addressed. 5:05 PM – Windows 10 isn’t the only ecosystem that is being updated. Enhancements are coming to MacOS, Android, Chrome, Google Glass, and Rugged/IoT. 5:05 PM – Changes to work styles require changes to IT security. Zero-trust security is a principle that states the device should never be trusted. Workspace ONE can help create a zero-trust environment. Workspace ONE allows for a defense-in-depth strategy where security can be applied at multiple layers. The partnership with Okta enables IT to set policies that can prevent users from accessing Okta applications unless the device is managed. When attempting to access the application, WS ONE will perform a device check before sending the user to Okta for authentication. Workspace ONE Trust Networks allows security tools to integrate with Workspace ONE Intelligence. This allows Workspace ONE to automate actions to prevent the user from introducing security risks into the environment. VMware is also announcing four new Trust Networks partners – Checkpoint, Palo Alto Networks, Trend Micro, and zScaler. 5:15 PM – Shikha Mittal and Angela Ge take the stage to discuss modernization of Windows Application Delivery. Intelligence and automation are being added into the Horizon control plane. This is built into the Horizon Cloud Control Plane. A cloud connector will be available to enable automation and intelligence for on-premises Horizon environments. Horizon is also available on VMC, and the cloud connector enables management of these environments as well. Horizon Cloud on Softlayer and Horizon Cloud on Azure IaaS are managed directly from the Horizon Cloud Management Console. The Horizon Cloud Management Console allows administrators to view all of their Horizon environments, both on-premises and in the cloud, and perform management actions against them. It also allows administrators to provision both Horizon on VMC and Horizon Cloud on Azure. 5:25 PM – The Workpsace ONE agent can be installed on Horizon desktops, and when the desktop is provisioned, it becomes a managed device. 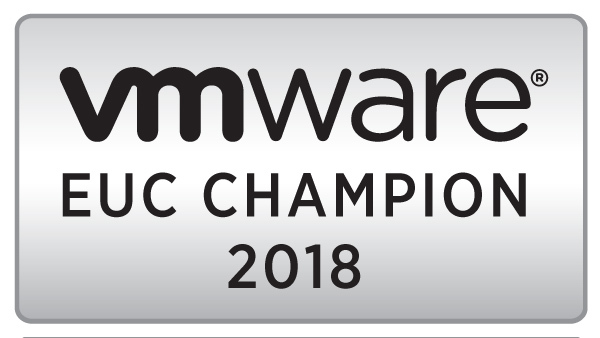 This enables VMware UEM policies to be applied to Horizon desktops as well as view intelligence about the desktop, applications, and security posture of the entire physical and virtual desktop estate. 5:30 PM – Announcing the Workspace ONE Intelligent Hub – combining the Workspace ONE app and the Airwatch Agent. Workspace ONE Intelligent Hub enables workflow driven activities with integrations into other enterprise systems like Service Now, an internal people directory, and a notifications page where the user can keep track of tickets and alerts from application notifications. In my last post on UEM, I discussed the components and key considerations that go into deploying VMware UEM. UEM is made up of multiple components that rely on a common infrastructure of file shares and Group Policy to manage the user environment, and in this post, we will cover how to deploy the file share infrastructure. The first of the two UEM file shares is the configuration file share. This file share holds the configuration data used by the UEM agent that is installed in the virtual desktops or RDSH servers. The UEM configuration share contains a few important subfolders. These subfolders are created by the UEM management console during it’s initial setup, and they align with various tabs in the UEM Management Console. We will discuss this more in a future article on using the UEM Management console. General – This is the primary subfolder on the configuration share, and it contains the main configuration files for the agent. FlexRepository – This subfolder under General contains all of the settings configured on the “User Environment” tab. The settings in this folder tell the UEM agent how to configure policies such as Application Blocking, Horizon Smart Policies, and ADMX-based settings. Applications – This is the first subfolder underneath the General folder. This folder contains the INI files that tell the UEM agent how to manage application personalization. The Applications folder makes up one part of the “Personalization” tab. Windows Settings – This folder contains the INI files that tell the UEM agent how to manage the Windows environment personalization. The Windows Settings folder makes up the other part of the Personalization tab. Some environments are a little more complex, and they require additional configuration sets for different use cases. UEM can create a silo for specific settings that should only be applied to certain users or groups of machines. A silo can have any folder structure you choose to set up – it can be a single application configuration file or it can be an entire set of configurations with multiple sub-folders. Each silo also requires its own Group Policy configuration. The second UEM file share is the user data file share. This file share holds the user data that is managed by UEM. This is where any captured application profiles are stored. It can also contain other user data that may not be managed by UEM such as folders managed by Windows Folder Redirection. I’ve seen instances where the UEM User Data Share also contained other data to provide a single location where all user data is stored. The key thing to remember about this share is that it is a user data share. These folders belong to the user, and they should be secured so that other users cannot access them. IT administrators, system processes such as antivirus and backup engines, and, if allowed by policy, the helpdesk should also have access to these folders to support the environment. User application settings data is stored on the share. This consists of registry keys and files and folders from the local user profile. When this data is captured by the UEM agent, it is compressed in a zip file before being written out to the network. The user data folder also can contain backup copies of user settings, so if an application gets corrupted, the helpdesk or the user themselves can easily roll back to the last configuration. UEM also allows log data to be stored on the user data share. The log contains information about activities that the UEM agent performs during logon, application launch and close, and logoff, and it provides a wealth of troubleshooting information for administrators. VMware UEM is perfect for multi-site end-user computing environments because it only reads settings and data at logon and writes back to the share at user logoff. If FlexDirect is enabled for applications, it will also read during an application launch and write back when the last instance of the application is closed. This means that it is possible to replicate UEM data to other file shares, and the risk of file corruption is minimized due to file locks being minimized. Both the UEM Configuration Share and the UEM User Data share can be replicated using various file replication technologies. As environments grow or servers are retired, this UEM data may need to be moved to new locations. Or it may need to exist in multiple locations to support multiple sites. In order to simplify the configuration of UEM and minimize the number of changes that are required to Group Policy or other configurations, I recommend using DFS Namespaces to provide a single namespace for the file shares. This allows users to use a single path to access the file shares regardless of their location or the servers that the data is located on. It’s not safe assume that everyone is using Windows-based file servers to provide file services in their environment. Because of that, setting up network shares is beyond the scope of this post. The process of creating the share and applying security varies based on the device hosting the share. The required Share and NTFS/File permissions are listed in the table below. These contain the basic permissions that are required to use UEM. The share permissions required for the HelpDesk tool are not included in the table. This post just provided a basic overview of the required UEM file shares and user permissions. If you’re planning to do a multi-site environment or have multiple servers, this would be a good time to configure replication. The next post in this series will cover the setup and initial configuration of the UEM management infrastructure. This includes setting up the management console and configuring Group Policy. The longevity of Windows 7, and Windows XP before that, has spoiled many customers and enterprises. It provided IT organizations with a stable base to build their end-user computing infrastructures and applications on, and users were provided with a consistent experience. The update model was fairly well known – a major service pack with all updates and feature enhancements would come out after about one year. Whether this stability was good for organizations is debatable. It certainly came with trade-offs, security of the endpoint being the primary one. The introduction of Windows 10 has changed that model, and Microsoft is continuing to refine that model. Microsoft is now releasing two major “feature updates” for Windows 10 each year, and these updates will only be supported for about 18 months each. Microsoft calls this the “Windows as a Service” model, and it consists of two production-ready semi-annual release channels – a targeted deployment that is used to pilot users to test applications, and a broad deployment that replaces the “Current Branch for Business” option for enterprises. Gone are the days where the end user’s desktop will have the same operating system for it’s entire life cycle. In order to facilitate this new delivery model, Microsoft has refined their in-place operating system upgrade technology. While it has been possible to do this for years with previous versions of Windows, it was often flaky. Settings wouldn’t port over properly, applications would refuse to run, and other weird errors would crop up. That’s mostly a thing of the past when working with physical Windows 10 endpoints. Virtual desktops, however, don’t seem to handle in-place upgrades well. Virtual desktops often utilize various additional agents to deliver desktops remotely to users, and the in-place upgrade process can break these agents or cause otherwise unexpected behavior. They also have a tendancy to reinstall Windows Modern Applications that have been removed or reset settings (although Microsoft is supposed to be working on those items). If Windows 10 feature release upgrades can break, or at least require significant rework of, existing VDI images, what is the best method for handling them in a VDI environment? I see two main options. The first is to manually uninstall the VDI agents from the parent VMs, take a snapshot, and then do an in-place upgrade. After the upgrade is complete, the VDI agents would need to be reinstalled on the machine. In my opinion, this option has a couple of drawbacks. First, it requires a significant amount of time. While there are a number of steps that could be automated, validating the image after the upgrade would still require an administrator. Someone would have to log in to validate that all settings were carried over properly and that Modern Applications were not reinstalled. This may become a significant time sink if I have multiple parent desktop images. Second, this process wouldn’t scale well. If I have a large number of parent images, or a large estate of persistent desktops, I have to build a workflow to remove agents, upgrade Windows, and reinstall agents after the upgrade. Not only do I have to test this workflow significantly, but I still have to test my desktops to ensure that the upgrade didn’t break any applications. The second option, in my view, is to rebuild the desktop image when each new version of Windows 10 is released. This ensures that you have a clean OS and application installation with every new release, and it would require less testing to validate because I don’t have to check to see what broke during the upgrade process. One of the main drawbacks to this approach is that image building is a time consuming process. This is where automated deployments can be helpful. Tools like Microsoft Deployment Toolkit can help administrators build their parent images, including any agents and required applications, automatically as part of a task sequence. With this type of toolkit, and administrator can automate their build process so that when a new version of Windows 10 is released, or a core desktop component like the Horizon or XenDesktop agent is updated, the image will have the latest software the next time a new build is started. Let’s take this one step further. As an administrator, I would be doing a new Windows 10 build every 6 months to a year to ensure that my virtual desktop images remain on a supported version of Windows. At some point, I’ll want to do more than just automate the Windows installation so that my end result, a fully configured virtual desktop that is deployment ready, is available at the push of a button. This can include things like bringing it into Citrix Provisioning Services or shutting it down and taking a snapshot for VMware Horizon. Virtualization has allowed for significant automation in the data center. Tools like VMware PowerCLI and the Nutanix REST API make it easy for administrators to deploy and manage virtual machines using a few lines of PowerShell. Using these same tools, I can also take details from this virtual machine shell, such as the name and MAC address, and inject them into my MDT database along with a Task Sequence and role. When I power the VM on, it will automatically boot to MDT and start the task sequence that has been defined. This is bringing “Infrastructure as Code” concepts to end-user computing, and the results should make it easier for administrators to test and deploy the latest versions of Windows 10 while reducing their management overhead. I’m in the process of working through the last bits to automate the VM creation and integration with MDT, and I hope to have something to show in the next couple of weeks. One of the most important aspects of any end-user computing environment is user experience, and a big part of user experience is managing the user’s Windows and application preferences. This is especially true in non-persistent environments and published application environments where the user may not log into the same machine each time. So why is this important? A big part of a user’s experience on any desktop is maintaining their customizations. Users invest time into personalizing their environment by setting a desktop background, creating an Outlook signature, or configuring the applications to connect to the correct datasets, and the ability to retain these settings make users more productive because they don’t have to recreate these every time they log in or open the application. User settings portability is nothing new. Microsoft Roaming Profiles have been around for a long time. But Roaming Profiles also have limitations, such as casting a large net by moving the entire profile (or the App Data roaming folder on newer versions of Windows) or being tied to specific versions of Windows. VMware User Environment Manager, or UEM for short, is one of a few 3rd-party user environment management tools that can provide a lighter-weight solution than Roaming Profiles. UEM can manage both the user’s personalization of the environment by capturing Windows and application settings as well as apply settings to the desktop or RDSH session based on the user’s context. This can include things like setting up network drives and printers, Horizon Smart Policies to control various Horizon features, and acting as a Group Policy replacement for per-user settings. User Data File Share – Network File Share where user data is stored. Depending on the environment and the options used, this can be multiple file shares. The UEM Console is the central management tool for UEM. The console does not require a database, and anything that is configured in the console is saved as a text file on the configuration file share. The agent consumes these configuration files from the configuration share during logon and logoff, and it saves the application or Windows settings configuration when the application is closed or when the user logs off, and it stores them on the user data share as a ZIP file. The UEM Agent also includes a few other optional tools. These are a Self-Service Tool, which allows users to restore application configurations from a backup, and an Application Migration Tool. The Application Migration Tool allows UEM to convert settings from one version of an application to another when the vendor uses different registry keys and AppData folders for different versions. Microsoft Office is the primary use case for this feature, although other applications may require it as well. UEM also includes a couple of additional tools to assist administrators with maintaining environment. The first of these tools is the Application Profiler Tool. This tool runs on a desktop or an RDSH Server in lieu of the UEM Agent. Administrators can use this tool to create UEM profiles for applications, and it does this by running the application and tracking where the application writes to. It can also be used to create default settings that are applied to an application when a user launches it, and this can be used to reduce the amount of time it takes to get users applications configured for the first time. The other support tool is the Help Desk support tool. The Helpdesk support tool allows helpdesk agents or other IT support to restore a backup of a user settings archive. There are a couple of questions you need to ask when deploying UEM. How many configuration shares will I have, and where will they be placed? – In multisite environments, I may need multiple configuration shares so the configs are placed near the desktop environments. How many user data shares will I need, and where will they be placed? – This is another factor in multi-site environments. It is also a factor in how I design my overall user data file structure if I’m using other features like folder redirection. Do I want to keep all my user data together to make it easier to manage and back up, or do I want to place it on multiple file shares. Will I be using file replication technology? What replication technology will be used? – A third consideration for multi-site environments. How am I replicating my data between sites? What URL/Name will be used to access the shares? – Will some sort of global namespace, like a DFS Namespace, be used to provide a single name for accessing the shares? Or will each server be accessed individually? This can have some implications around configuring Group Policy and how users are referred to the nearest file server. Where will I run the management console? Who will have access to it? Will I configure UEM to create backup copies of user settings? How many backup copies will be created? These are the main questions that come up from an infrastructure and architecture perspective, and they influence how the UEM file shares and Group Policy objects will be configured. Since UEM does not require a database, and it does not actively use files on a network share, planning for multisite deployments is relatively straight forward. In the next post, I’ll talk about deploying the UEM supporting infrastructure.